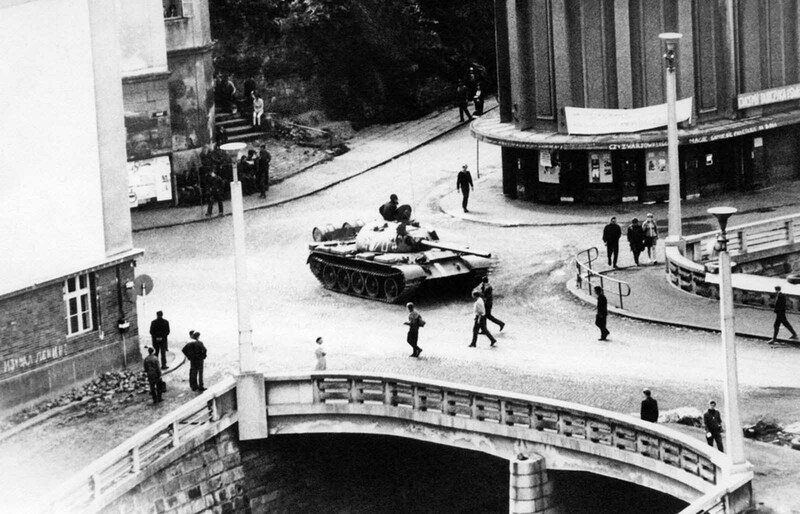 Prague residents surround Soviet tanks in front of the Czechoslovak Radio building, in central Prague, during the first day of the Soviet-led invasion of Czechoslovakia, on August 21, 1968. 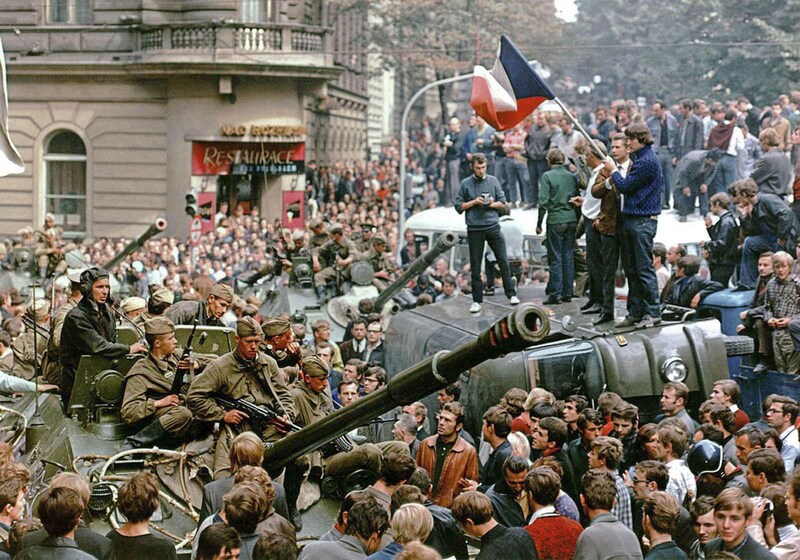 Some 250,000 Soviet and Warsaw Pact troops invaded Czechoslovakia overnight from August 20 to 21, 1968, to halt a blossoming political and cultural liberalization, bringing an abrupt end to the Prague Spring and tightening the Kremlin’s grip. 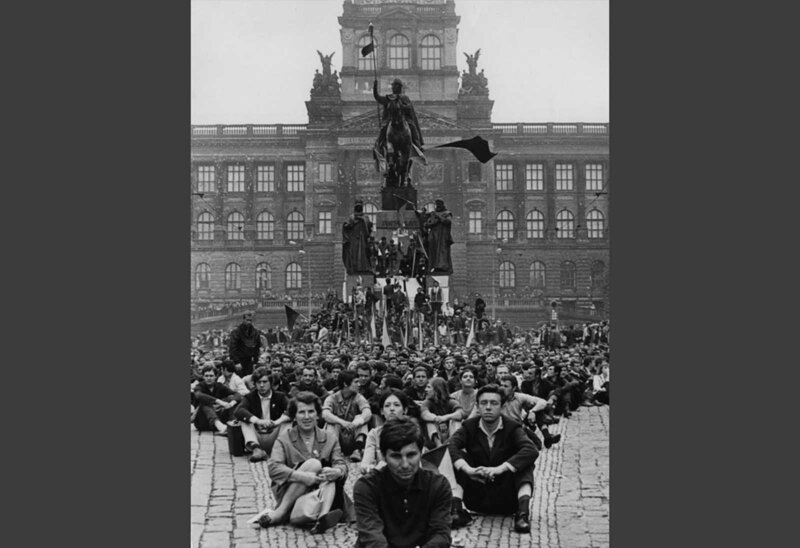 The first months of 1968 had brought a renaissance of political and cultural life in what was then Czechoslovakia. 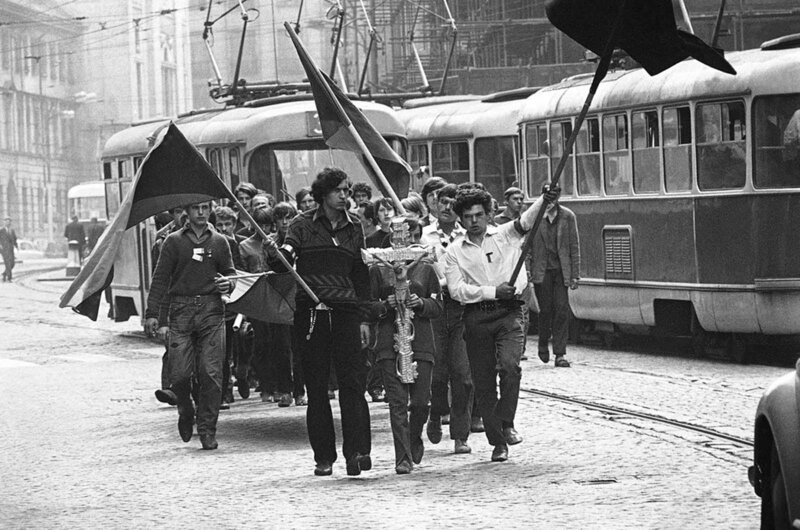 Journalists and students were calling for an end to censorship, public rallies in support of reform erupted in Prague and beyond, and that year’s May Day commemorations were seized upon by those demanding greater freedoms. Upon assuming the Czechoslovak leadership in January by becoming first secretary of the Communist Party of Czechoslovakia, Alexander Dubcek quickly declared his intention to push ahead with liberalizations that included freedom of speech and religion, an end to censorship and travel restrictions, and industrial and agricultural reforms. By April the government had published an “action programme” outlining Dubcek’s plans to establish “socialism with a human face”. The plan provided for a gradual democratization of the political system over a 10-year period, economic liberalizations and called for Communists to compete with other parties in future elections. The government officially ended its censorship policy in June. Alarmed by these moves and what appeared to be the beginning of the end of Czechoslovak Communism, several fellow Warsaw Pact nations made their objections known in a July communiqué, saying the Czechoslovak reform programme “jeopardizes the common vital interests of other socialist countries”. 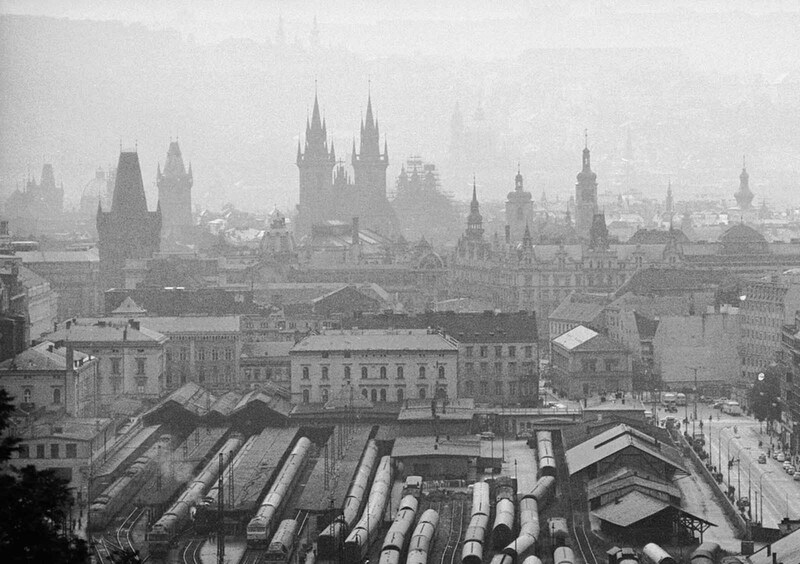 A view of the Czechoslovakian capital, Prague, from the surrounding hills, August 1968. Soviet leader Leonid Brezhnev tried to curtail the Prague Spring’s momentum with a series of talks, meeting directly with Dubcek in late July in the small border town of Cierna nad Tisou. Brezhnev demanded key reformers be removed from leadership positions and restrictions be tightened on the media; Dubcek defended the reformist moves while reiterating his commitment to the Warsaw Pact and the Eastern Bloc economic alliance known as Comecon. Unappeased, by mid-August the Kremlin had decided to intervene more forcefully. Shortly before midnight on August 20, 250,000 Soviet and Warsaw Pact troops from Poland, Hungary, Bulgaria and East Germany (Romania and Albania refused to take part) invaded Czechoslovakia to put an end to the reform efforts, with the occupying forces eventually totaling 500,000. “Operation Danube” was the largest military mobilization in Europe since the end of World War II. 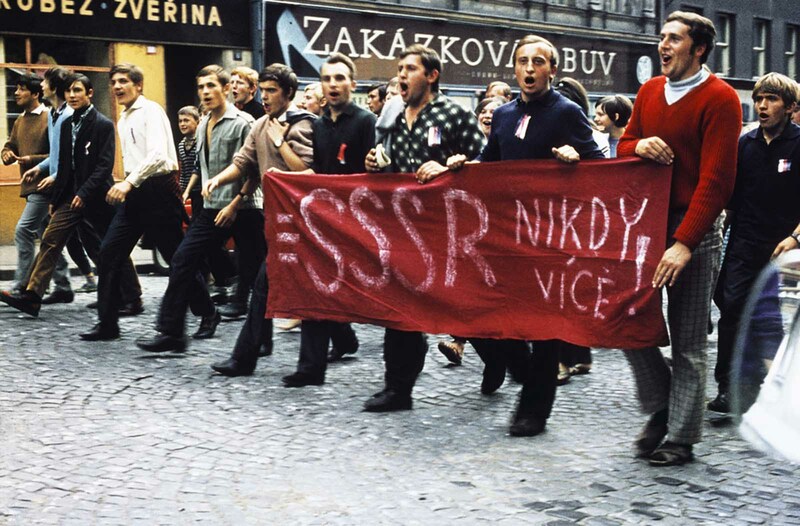 Although the Soviet crackdown on Czechoslovakia was swift and successful, small-scale resistance continued throughout early 1969 while the Soviets struggled to install a stable government. Finally, in April of 1969, the Soviets forced Dubcek from power in favor of a more conservative administrator. In the years that followed, the new leadership reestablished government censorship and controls preventing freedom of movement, but it also improved economic conditions, eliminating one of the sources for revolutionary fervor. Czechoslovakia once again became a cooperative member of the Warsaw Pact. 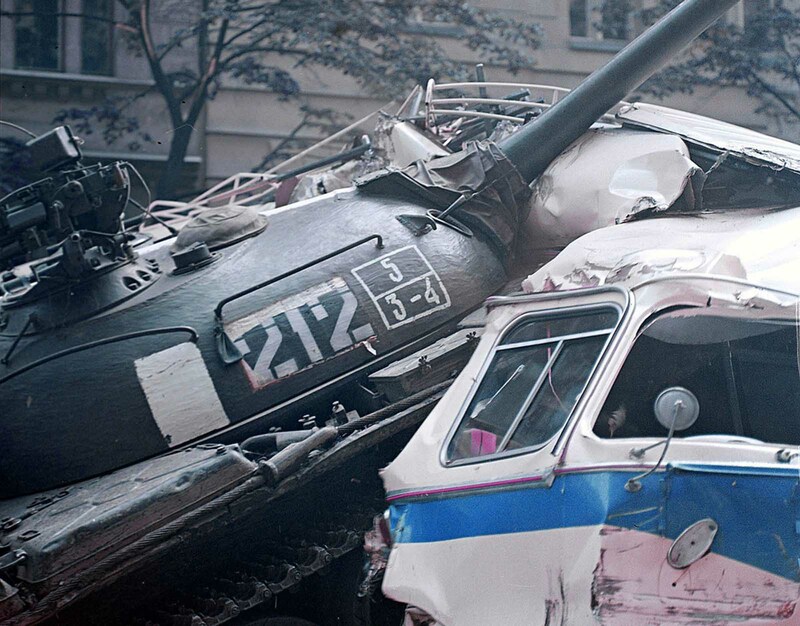 After the invasion, the Soviet leadership justified the use of force in Prague under what would become known as the Brezhnev Doctrine, which stated that Moscow had the right to intervene in any country where a communist government had been threatened. This doctrine, established to justify Soviet action in Czechoslovakia, also became the primary justification for the Soviet invasion of Afghanistan in 1979, and even before that it helped to finalize the Sino-Soviet split, as Beijing feared that the Soviet Union would use the doctrine as a justification to invade or interfere with Chinese communism. 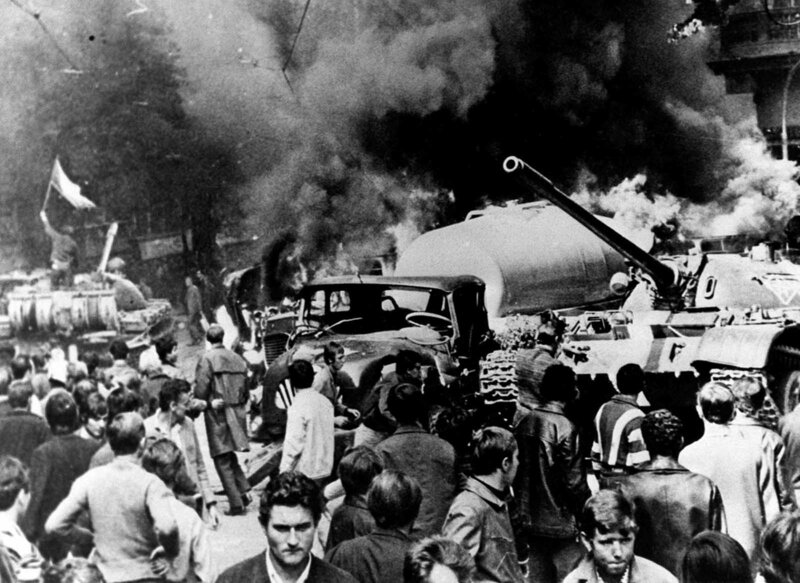 A photo taken in Trutnov, Czechoslovakia, during a confrontation between demonstrators and the Warsaw Pact troops and tanks, which invaded the country in August of 1968. 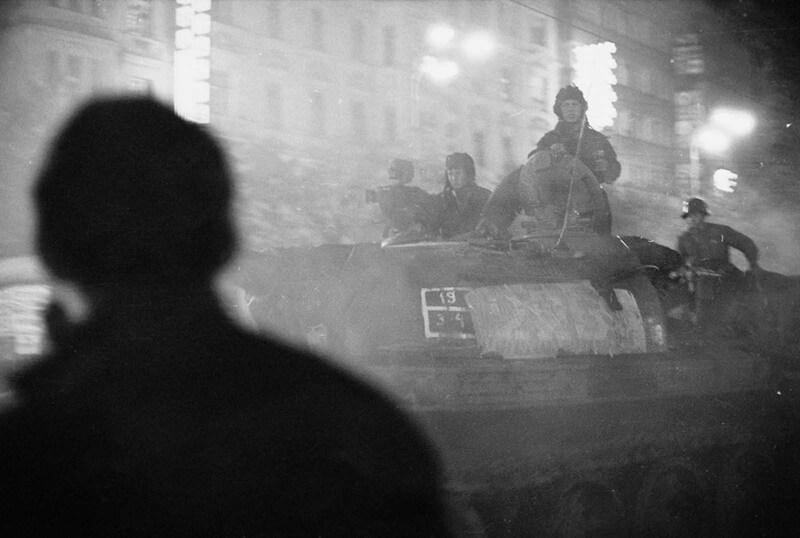 A shadowy figure watches Soviet tanks advance through the streets of Prague after nightfall in August 1968. Prague residents, carrying a Czechoslovakian flag and throwing Molotov cocktails, attempt to stop a Soviet tank in downtown Prague on August 21, 1968. 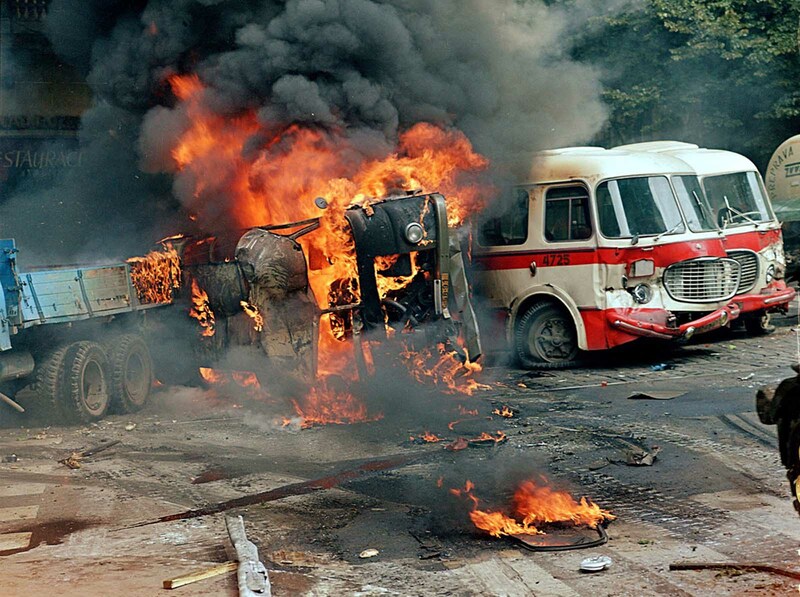 A barricade made from trucks and buses burns in front of the Czechoslovak Radio building, in central Prague, on August 21, 1968. A Soviet army tank rolls over a barricade made from trucks and buses in front of the Czechoslovak Radio building on August 21, 1968. 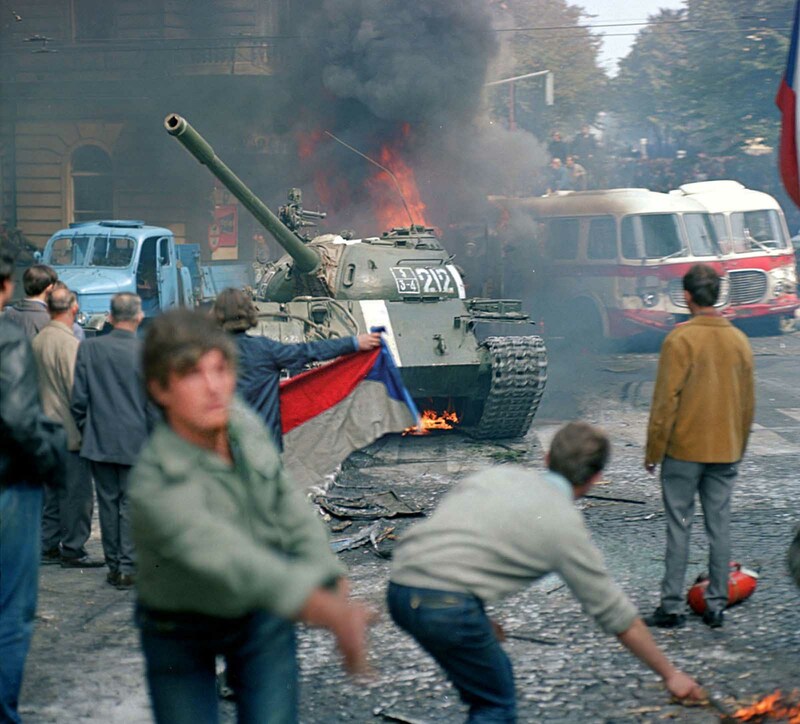 A Soviet tank, burning vehicles, and sullen citizens are seen in Prague on August 21, 1968, as Soviet troops entered the Czechoslovakian capital. 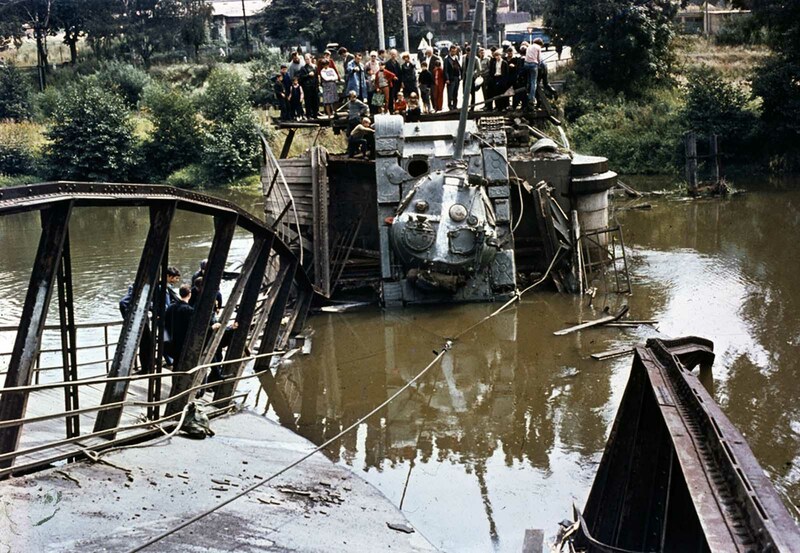 A Soviet tank is out of action after a bridge it was crossing gave way on August 21, 1968. One witness said the bridge had been dynamited, but the span may have collapsed due to the heavy weight of the tanks crossing it. 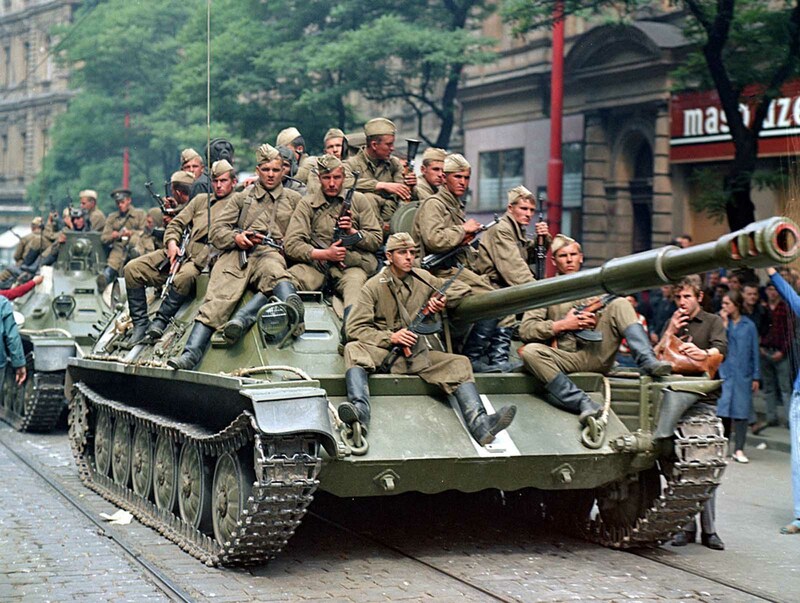 Soviet army soldiers sit on their tanks in front of the Czechoslovak Radio building, in central Prague, on August 21, 1968. 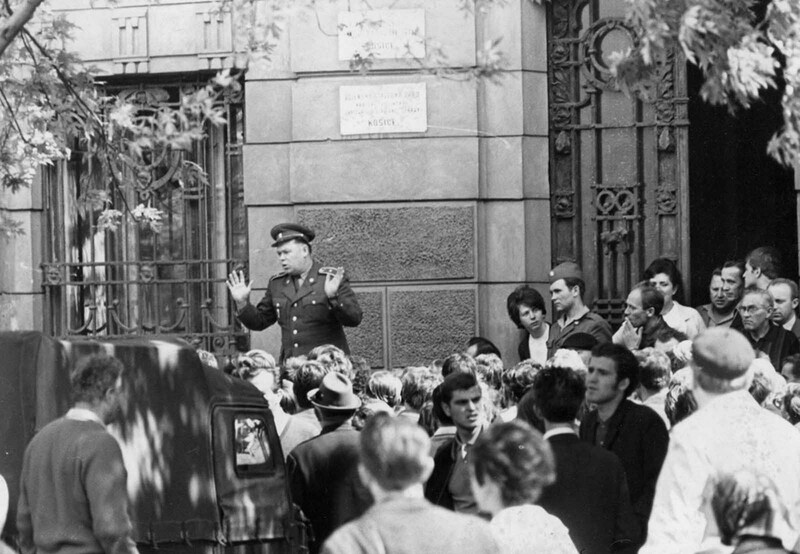 A member of the Czechoslovakian army is jeered by locals in Košice, Czechoslovakia, on August 21, 1968, as he addresses them outside the city hall shortly after troops had occupied the town as part of the Soviet invasion. 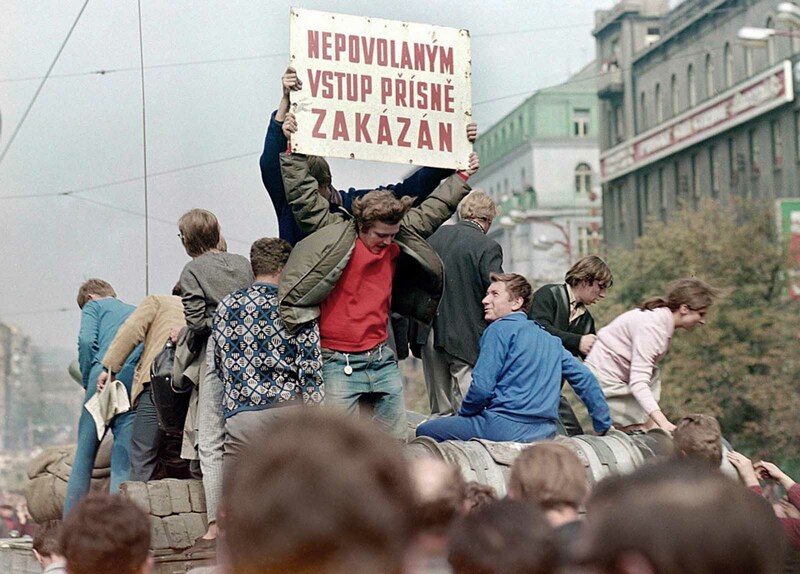 Thousands of protesters sit in Wenceslas Square, in downtown Prague, on August 24, 1968, demonstrating against the Soviet invasion. 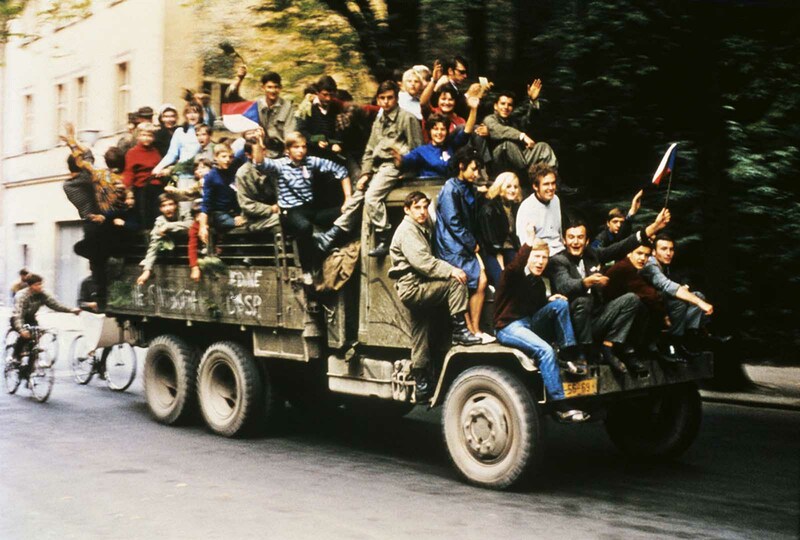 Czechoslovakian army trucks take young people around Prague as Soviet tanks had halted on the outskirts of town and began a siege of Czech army barracks. The passengers waved Czechoslovakian national flags and chanted national songs and patriotic slogans. 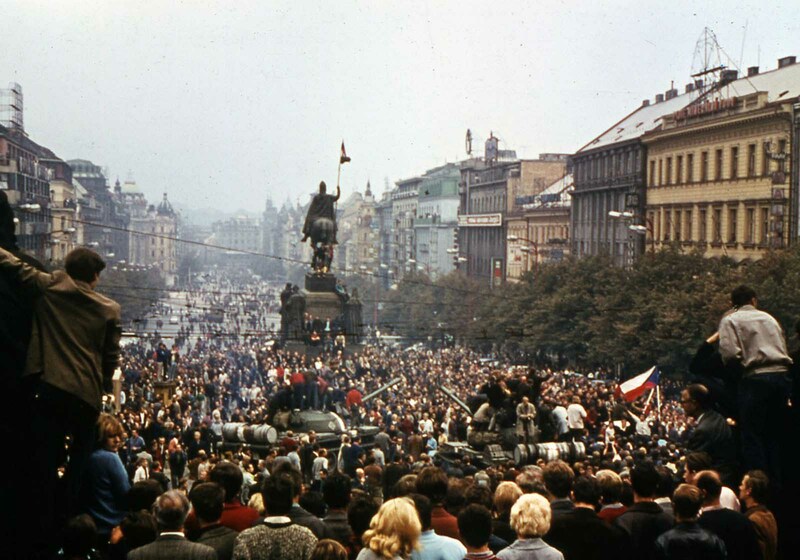 Thousands of protesters crowd into Wenceslas Square, in downtown Prague, in August 1968, demonstrating against the Soviet invasion. Czechs jeer a Soviet tank in downtown Prague. 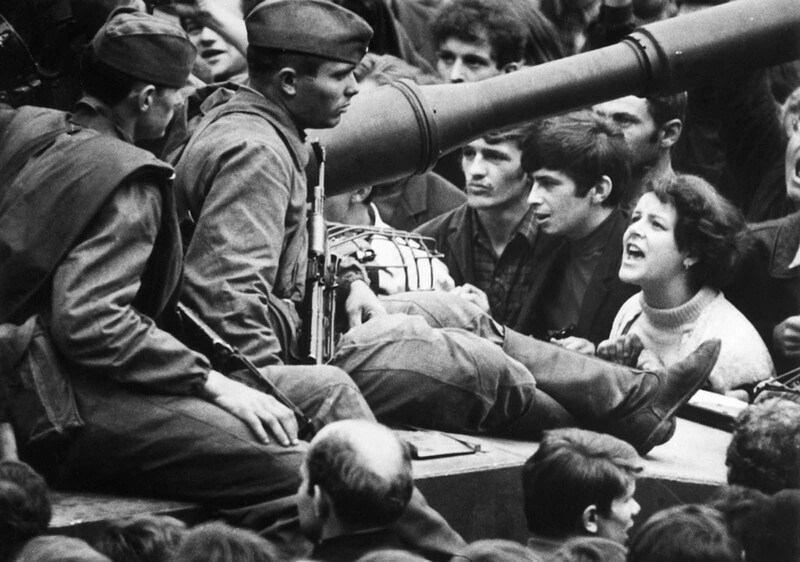 A young Czech lets her feelings be known as she shouts at Soviet soldiers sitting on tanks in the streets of Prague on August 26, 1968. 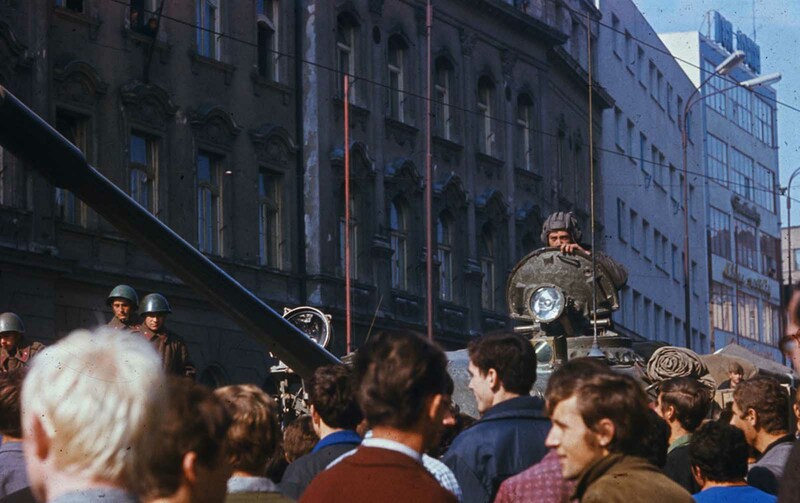 Angry citizens surround a Soviet tank and climb its turret to mock the crew in Bratislava, Czechoslovakia, on August 22, 1968. 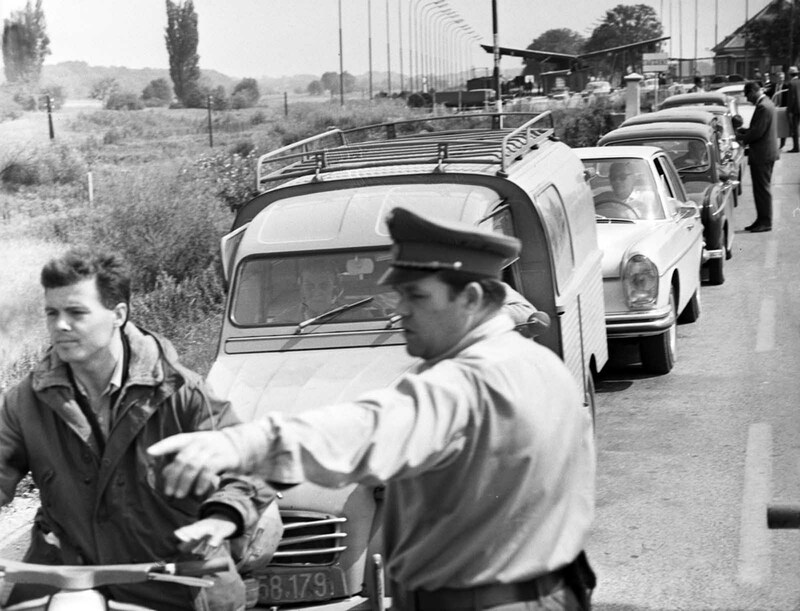 Czechoslovakian refugees flee the country, photographed here at the Austrian border, in autumn 1968. 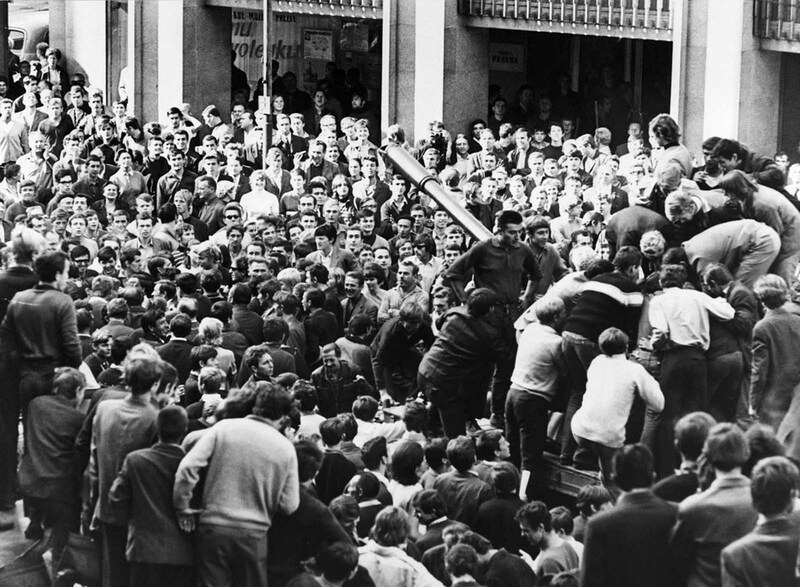 Youths carry a crucifix on their way to the burial of a friend shot by the Soviets on August 27, 1968, in Prague. 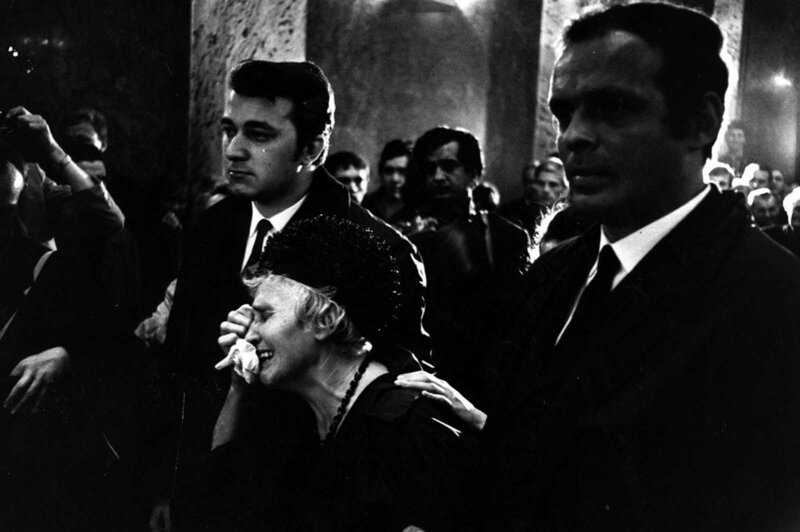 A woman weeps at a funeral for one of the victims of the fighting in Czechoslovakia. 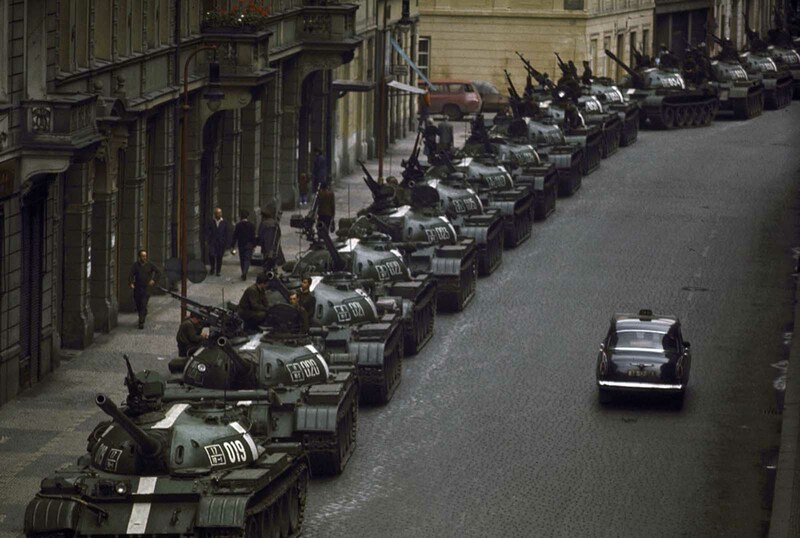 A lone car passes dozens of Soviet tanks during the 1968 invasion of Czechoslovakia. 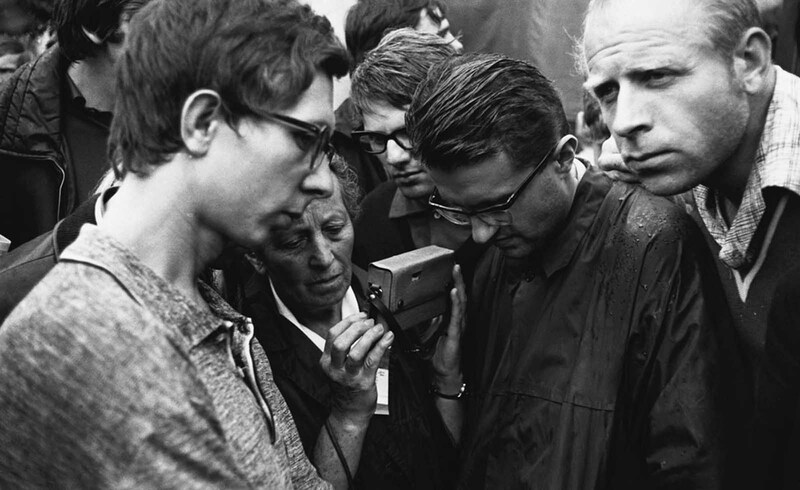 Czechoslovakians gather to listen to a transistor radio for news of the Soviet invasion and occupation on August 29, 1968. 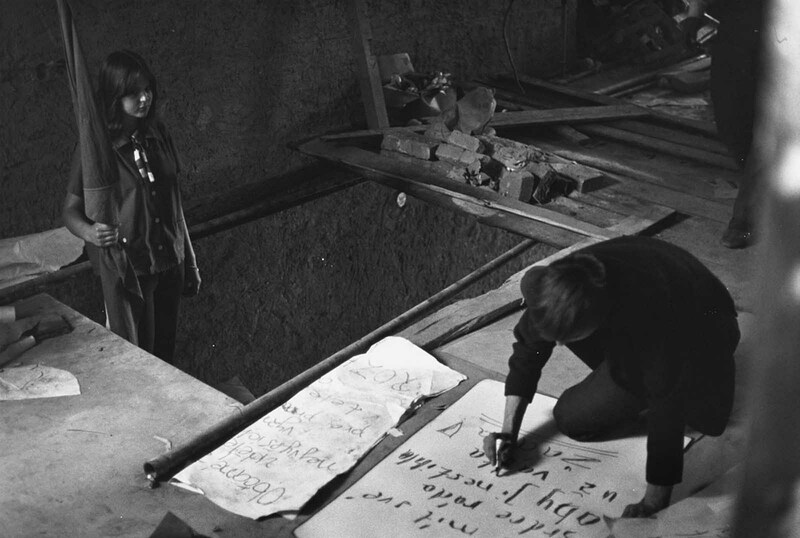 Students in the underground movement make anti-Russian posters on September 3, 1968, in Prague. 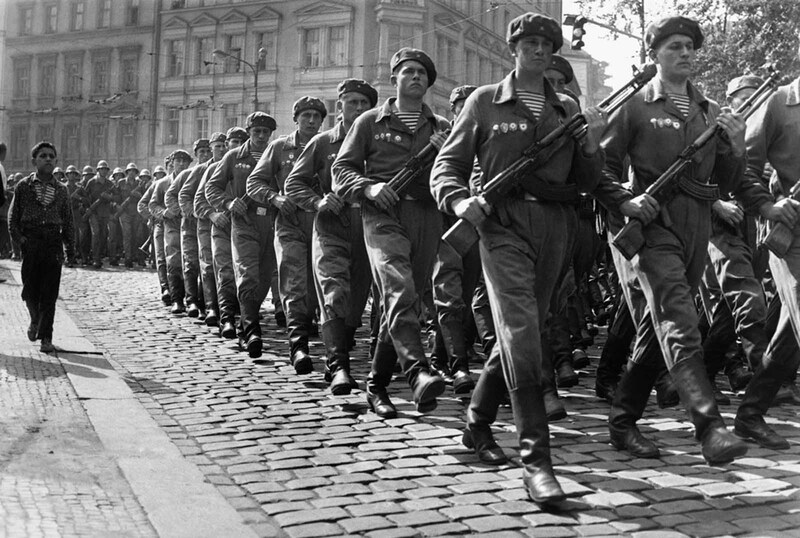 Soviet troops march through Prague in September 1968. After the invasion, a permanent Soviet presence was established in Czechoslovakia to prevent further reforms. (Photo credit: Libor Hajsky / Reuters / AP / Hulton-Deutsch Collection).